I have Tim Burton on the brain today. I really do. I. Love. Him! Always have. If Helena Bonham Carter (and The Hubbs, for that matter) wasn't standing in my way, I would marry him myself. 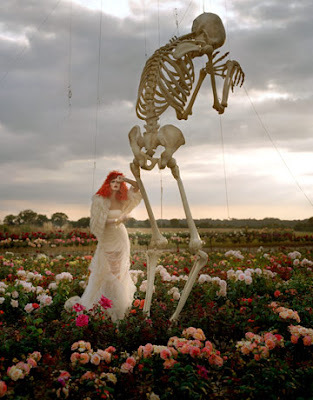 I am obsessed with the idea of the Tim Burton inspired wedding. So much is good about that idea. But (and this is a HUGE but), only if it is done with taste. This is a theme that could go from chic to campy in one overly taffeta-ed instant. Ahh, but that is fodder for another post my lovelies...another post at another time. So today I leave you with this. And this. I'm especially in love with this picture because I see so much emotion. I love that the skeleton looks to be in despair, with the way it's turned from us and hunched into its hands. Loving this. Photos found here and property of Harper's Bazaar. The Words Right Out of My Mouth! Ok, so for months I've been working on a blog post about the most outrageous, over the top wedding themes and ideas. One such idea, for me has always been the Moulin Rouge theme. I. Love. This. I'd been trying to properly articulate my big, big vision for this type of soiree into the fluid, streamlined prose I'm used to writing. This has been futile. I had almost given up hope, when I stumbled on to this. 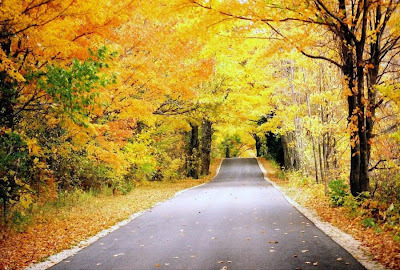 This little post is from one of my new favorite blogs, Lolliblog-Blogalicious. I am loving this Internet gem so hard right now, I simply can't breathe. I really identify with the message of having an exquisitely executed event and not blowing the budget. Mostly, I love that Lollipop Events & Designs is a perfect storm of design loveliness. I recommend this site to any couple looking for advice, in simple, straight forward language. Amazing! I started following them a couple months ago. I'm never disappointed. Never. I encourage you all to check them out! You won't be sorry! Simply brill! This year, the same Allison that designed the wonderful invites also provided me with favor tags and cupcake toppers. The emblem, you'll notice matches the skull on the invites. We removed the glasses from the design, because I really didn't want to get too matchy-matchy or cutesy. The toppers are 1" round and the favor tags are 2" round. The toppers were super easy and I was able to crank out 100 of them in no time at all! You'll find the instructions for both below. Try printing them on ivory or light gray paper for best results. I used a metallic ivory text weight paper for mine and they turned out beautifully! To make the toppers: 1. Cut out the topper, using a 1.5" round paper punch. Put like colors together, in pairs. 2. Put permanent adhesive tape on the back of one of the toppers. 3. Position head of skewer (I used bamboo) in the center of the topper. You'll end up with something that looks like a lollipop. 4. Cover stick with second topper and press to bond. These are also perfect for use in hors' d oeuvres. To make the tags: Simply punch out tags using a 2" round paper punch. Use a 1/8" hole punch to create a hole at the top of the tag. Run ribbon or cord of your choice through the hole and tie the ends. Affix to package or favor. Try using them without the hole for a chic alternative to a hanging tag. I just loved these both so much I couldn't help but share them with you. I hope you enjoy them and Happy Halloween from Renegade Soiree! Hello all! I am so sorry to have been silent so long. Boo on me. My October has just been filled to the brim with fabulocity! I am planning a couple of events, working my fingers to the bone at the 9 to 5 and trying to get the redecorating under control before it gets to be too chilly to paint. I've also picked out a Halloween costume for the Fur Baby (I had to choose between "Pumpkin" and "Lobster") and I'm proud to say that my little girl will be the cutest Pumpkin ever. Stay tuned for pictures. Now down to business. I have sooo much to share with you all. The latest in winter wedding trends, gowns and other wedding finery. I have been deep in the heart of the Twitterverse and I have met lots of exceptional vendors and will be doing features on all of them. In the spirit of the spookiest month of the year, I thought I'd give up a few of my favorite tips and topics. Starting with Pumpkin carving! These two little beauties I found while browsing through the Martha Stewart Living website. The got me thinking about what I look for and what I try to accomplish when carving pumpkins. I came up with a few tips to share with you. 1. Search for the perfect pumpkin. For me, picking out the pumpkin in the best part of the process. I always take my time (too much time, if you ask The Hubbs). Look for fresh ones with sturdy stems, flat bottoms and no bruises. Beyond that, the possibilities are as limitless as the sky! 2. Cut out the lid. Always cut at an angle as this will prevent the lid from falling in when you replace it. Boning knives, fillet knives and other smooth blades seem to be best suited for the job. 3. Remove all the goop. Yes, goop. It's a technical term. You could go out and purchase an expensive, specialized tool to do this, but for me, an ice cream scoop does the trick. You'll want to try to thin the inner wall of the carving area. For best results, don't go any thinner than about 1 1/4". This will make it easier to pierce the shell. 5. Perserve your pumpkin. Rub petroleum jelly (Vaseline) on the cut edges to seal in moisture and slow shriveling. If your pumpkin starts to shrivel anyway, try putting the pumpkin face down in ice water for up to eight hours. 6. Safety first. If you like to leave the lid on while candles are lit, simply cut a small "chimney" in the lid to allow the heat to escape. First, allow the candle to burn for awhile with the top on, then cut a small hole where the lid has blackened. 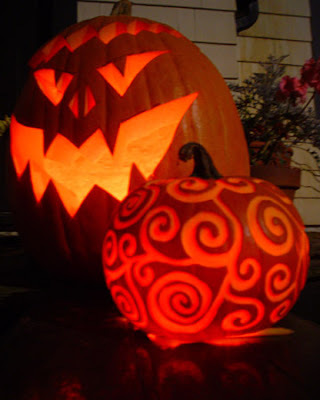 Always use flickering LED lights in pumpkin where children and pets are likely to get at them. Small fingers and paws can be easily injured. If using real candles, never leave them burning unsupervised. The most important tip I can give you? Have fun! Pumpkin carving is something best done with friends and family. It was always a big tradition in my family (pumpkins, cider, toasted pumpkin seeds and monster movies on AMC). Someday, I hope to create joyful, lasting memories with my children ( I also want to be the Mom who makes the best school lunches and chocolate chip cookies). Need some ideas to get you started? Martha Stewart has it all. Truly inspiring!